If you want to create a dreamy bedroom for your baby, you'll definitely want to consider our eyelet crib bedding and lace crib bedding themes. Lace and white eyelet baby bedding was very popular years ago, and will never go out of style. The beautiful fabrics are woven with the utmost precision and care, and rooms decorated with lace evoke a feeling of peacefulness, tranquility, and serenity, especially our white lace baby bedding set which also makes a great princess crib bedding theme. 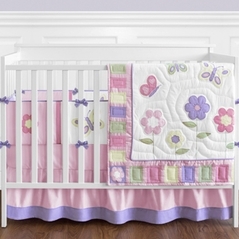 The accessories to white eyelet crib bedding can be used to either keep the peace or add some energy to the room. For more great ideas check out our toile crib bedding and celestial moon and stars baby bedding set. And because Beyond Bedding only carries the finest white lace baby bedding sets from brand name designers such as Sweet Jojo Designs, we are sure that you will be satisfied by any of our wide selection of bedding and matching accessories.